Every model released by Chevrolet is a real beast, and taking a first glimpse at one, you get excited by the extremely aggressive design which sits at the very bases of its personality. And the 2016 Chevrolet Camaro, the direct competitor of the Ford Mustang is indeed an authentic muscle car, with brute force and by the way it stands on the road, a real killer. We have seen many modifications added to the Chevrolet Camaro along the years and the latest one provided on the 2016 Camaro model below is perhaps one of the most standout ever seen; in my own opinion, of course! This lad here involves the fitting of a high-performance exhaust system provided by the technicians from Borla tuner, which mainly deal with power upgrade and mechanical customizations. In this case, their in-house built exhaust system improves the car`s performance and gives it a more aggressive engine growl. The exhaust is available for both the 2.0-liter Turbo and the 3.6-liter V6 versions, and consists of the Oxnard system, entirely made from aerospace-grade, T-304 stainless steel and massive tips with two-tip and four-tip configurations, Y-pipe center section, ATAK and S-Type muffler technology, Performance and Touring mid-pipe, and valve control. 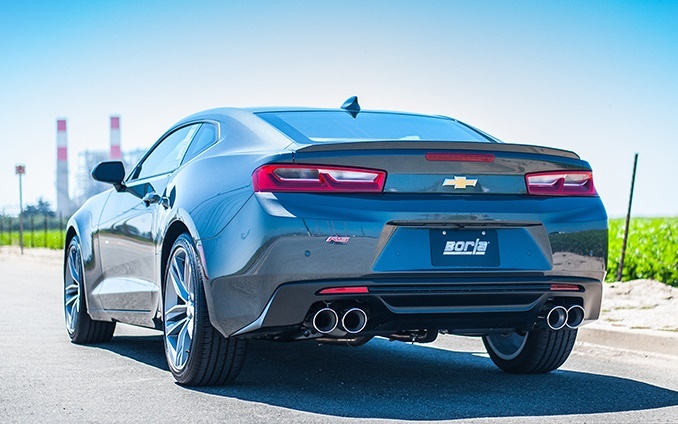 Available only for the 2.0-liter, the Touring Mid Pipe or the Performance Mid Pipe and Performance Pipe, are used for different competition, auto shows and different events that are destined for Chevrolet products alone and not only. But if you want to hear the real growl, just sit back and push the play button below! Make sure your audio system is kicked off to the max! Audi Allroad: Ladies And Gentlemen, Place Your Orders!